Pumpkins, as well as other squashes, are native to North and Central America. They were an important part of Native American cuisine long before the conquistadors “discovered” the Americas. Christopher Columbus is credited with bringing pumpkin seeds back to the Europe. The Europeans didn’t really know what to do with the strange foods from the new world though. They eyed crops like tomatoes and potatoes with suspicion, fearful that the foods were poisonous. Pumpkins fared slightly better but were held in low regard and only the poorest people ate them. Even today, pumpkin doesn’t have much place in our diets. It gets taken out a couple of times a year to make pies (usually from overly-sweetened canned versions) and maybe a few foodies will stuff and roast a squash. When people do eat pumpkin, or carve pumpkins for Halloween, they ironically usually throw away one of the healthiest parts of it: the seeds. Pumpkin seeds, also called by their original Mexican name of , also called by their original Mexican name of pepitas, have numerous health benefits ranging from reducing cholesterol levels to improving men’s prostate health. Here are just some of the great benefits of eating pumpkin seeds. 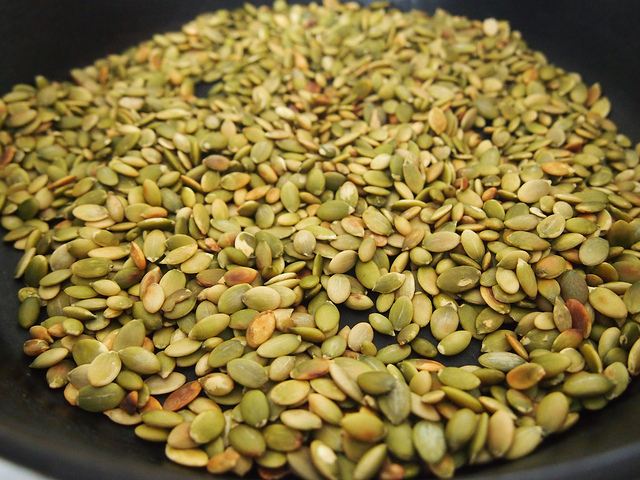 *Pepitas are pumpkin seeds which have been shelled! Various studies have found that pumpkin seeds or pumpkin seed oil can reduce bad LDL cholesterol levels and increase HDL cholesterol levels. Considering that heart disease is still the #1 killer in the US, this is very good news. There is also evidence that pumpkin seeds might prevent cholesterol from hardening in the arteries. The heart-health benefits of pumpkin seeds are attributed to their high levels of phytosterols, a natural chemical which can block cholesterol absorption in the small intestines. Pumpkin seeds have a higher concentration of phytosterols than any other nut or seed. Pumpkin seeds may also help heart health by regulating nitric oxide levels (which is responsible for dilating blood cells, and thus regulating blood pressure). Having trouble sleeping? Try eating a handful of pumpkin seeds a few hours before going to bed. Pumpkin seeds are rich in the amino acid tryptophan, the same amino acid which is notoriously found in turkey and attributed to making us feel sleepy after Thanksgiving dinner. Tryptophan helps you sleep because it gets converted into serotonin in the body, which is then turned into the sleep hormone melatonin. Because of its high tryptophan levels and ability to increase serotonin naturally, researchers are looking into pumpkin seeds as a possible cure for some mental health disorders like depression and anxiety. According to the National Institute of Health, many men over 40 and 90% of men over 80 will experience a condition called Benign Prostatic Hyperplasia (BPH) in which the prostate becomes enlarged. This is uncomfortable and can lead to urination problems. Numerous studies have shown that pumpkin seeds can effectively reduce prostate size. 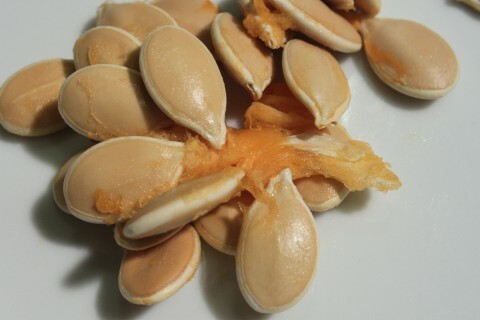 It is the phytosterols in pumpkin seeds which may shrink prostate. Pumpkin seeds may also contain chemicals which prevent testosterone from being turned into a different form, dihydrotestosterone (DHT). High levels of DHT cause prostate enlargement. DHT also causes male pattern baldness, so pumpkin seeds might even help men prevent male pattern balding! While pumpkin seeds may not contain much calcium, they do contain vast amounts of other minerals which are important for bone health, including magnesium, manganese, zinc, and phosphorous. While there aren’t any significant studies (that I am aware of) which specifically look at pumpkin seeds and bone health, numerous studies have shown a link between zinc deficiency and osteoporosis. Zinc deficiency is a huge concern, in part because foods are now grown on nutrient-depleted soil. A PLOSONE study found the global prevalence of zinc deficiency to be upwards of 17%. Even in wealthy western countries, zinc deficiency was common at upwards of 7.5%. A single ounce of pumpkin seeds will provide 14% of your RDA for zinc. Pumpkin seeds are also rich in antioxidants which can boost immunity. Combined with zinc, which is also important for immunity, pumpkin seeds can be your best friend the next time you get a cold. The antioxidants in pumpkin seeds can also reduce inflammation, which is why they are recommended for people with arthritis. How to Get the Health Benefits of Pumpkin Seeds? Pumpkin seeds are really tasty, so you can just eat them as a snack. After scooping them out of a pumpkin, roast them and enjoy. But you might find it more exciting to start including them in your meals. My favorite way of eating them is to put them on top of a salad. They give the salad a nice crunch and richer taste. If you’ve got a high-powered blender, then you can add pumpkin seeds to your smoothies. Health food stores also sell pumpkin seed butter which you can use instead of peanut butter on sandwiches or sweets. When I bake my own bread, I sometimes throw a handful of pepitas along with some other seeds into the dough. 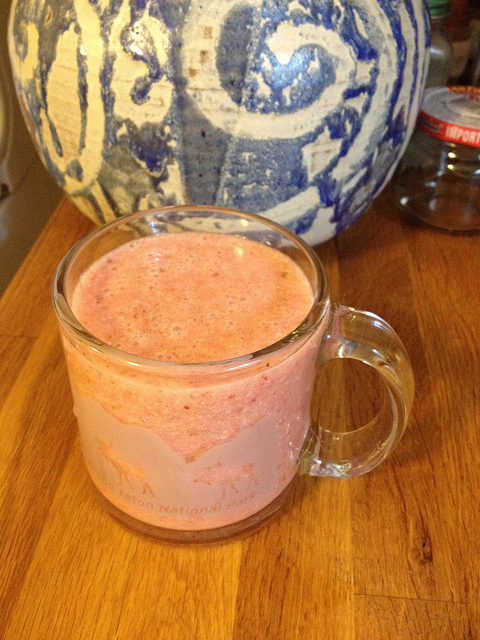 Blend everything in a high-power blender and enjoy! If your blender isn’t powerful enough to puree the pumpkin seeds, you might want to soak them overnight first to make them softer.